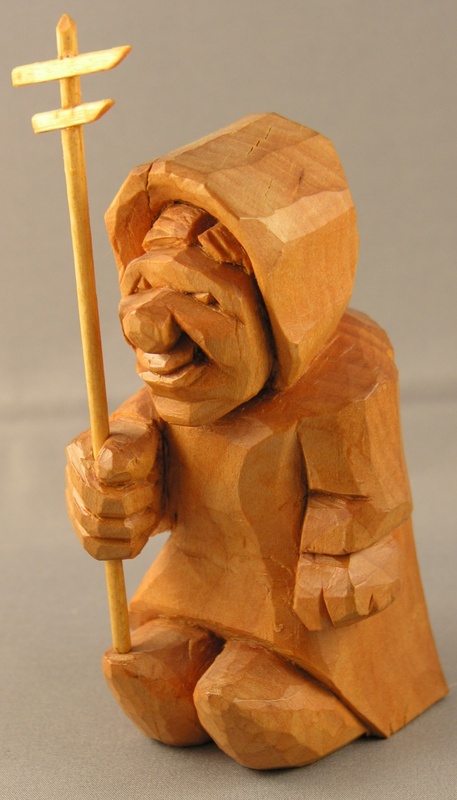 This is a wood spirit carved in Apple that was copied from an article by Keith Howard in Woodcarving Illustrated Summer 2011. I was interested in how the author had achieved such a good depth of field which in time I think I managed to achieve after many hours of work. 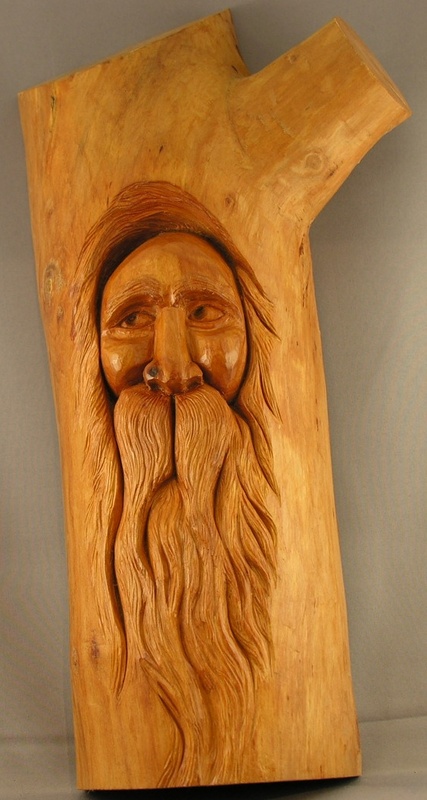 The wood was carved within 3 months of the tree being felled, and in order to minimize drying checks (cracks) the back of the carving was flattened with a chain saw and deeply grooved into the heartwood throughout the length. Two years on the wood is dry with no cracks. Depth of field is enhanced by deep "framing" cuts done with a very sharp knife and lots of work. I sketched out this caricature from a cartoon I found on the Fantasia website, a Walt Disney film made in the 1940's. 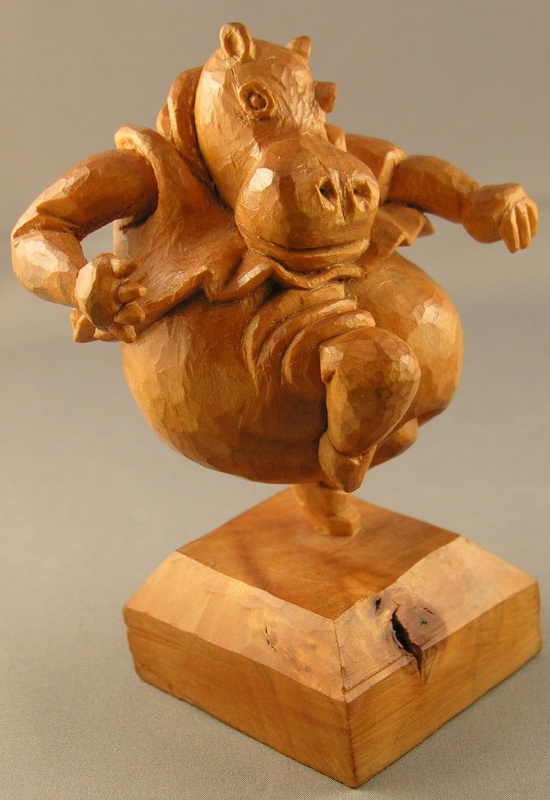 I was attracted by the action of the piece which posed a few carving challenges. 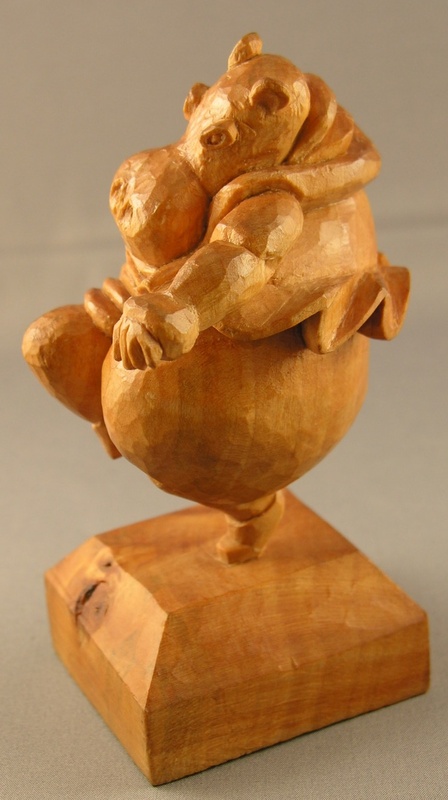 Hippy-shake is carved from one piece of wood, the complex symmetry necessitated several scaled sketches. 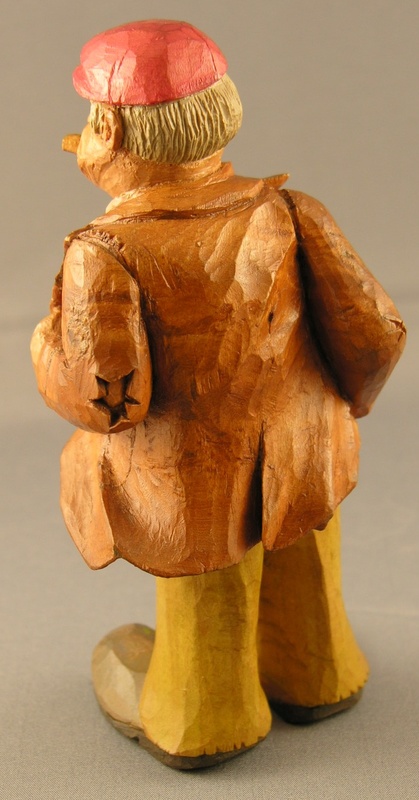 Most of the carving was completed with a knife, except in concave depressions where small gouges were used. The knife was particularly effective in carving the deep folds of the tutu. The source of this pattern is obscure like the previous post. I was attracted by the body language, something that hitherto I have paid little attention to. The body language spells a miserable mood! I went to town with stylized folds for the oversize trousers, which caught the effect I was after. 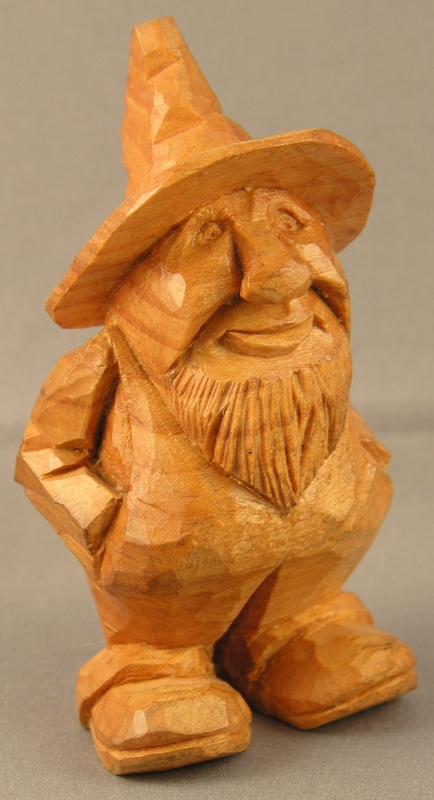 Most (90%) of the carving was completed with a knife. I resort to gouges where concave cuts are required. The source of this pattern is obscure. Suffice to say that he is one of the old country sons and can be seen in Scandinavian festivals throughout the Midwest of the US. In this instance I have broken some rules and mixed flat plane carving with some of my own style. I used this occasion to practice a few stylized folds which worked out quite well. 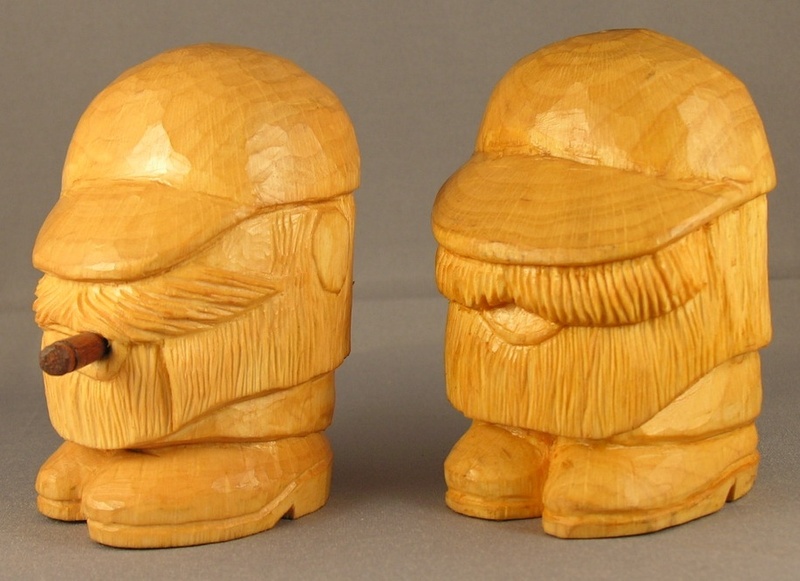 These 2 characters I took from the publication Caricature Carving-The Best of Woodcarving Illustrated, a magazine from the USA. Finish: Linseed oil and beeswax polish. Ozzy is an Ozark mountain man, whilst Olgit can be found anywhere in central USA. Both figures were carved quite rapidly with a knife, following very clear illustrations. 1. Scrub the carving with warm soapy water to remove hand grease. 2. Wipe off water with a paper tissue, then before drying occurs liberally coat the wood with a mixture of 75% boiled linseed oil and 25% turpentine, dabbing off any excess. This prevents the grain from swelling and raising, and it smells nice! Allow to dry over say 14 days. 3. Brush on wax of choice. I initially used beeswax but now I use Rennaissance wax to resist finger marking. Allow to dry for a few days, then burnish with a soft brush to reach into the deeper cuts. My goal was to achieve simplicity, and hopefully some speed since all previous work had been relatively slow going with me getting too involved with detail. The flat plane carving was done with an American style carving knife tailored to fit my hand (see later post). A cross section of an arm, the body or head should resemble an octagon, with shadows created by deeper cuts. In my younger days we had a local tramp we called Smokey Joe. He would get about the Kent countryside on a tyre-less bicycle with his worldly belongings hanging from the handlebars. It made our day to see him and this little caricature brings back fond childhood memories. 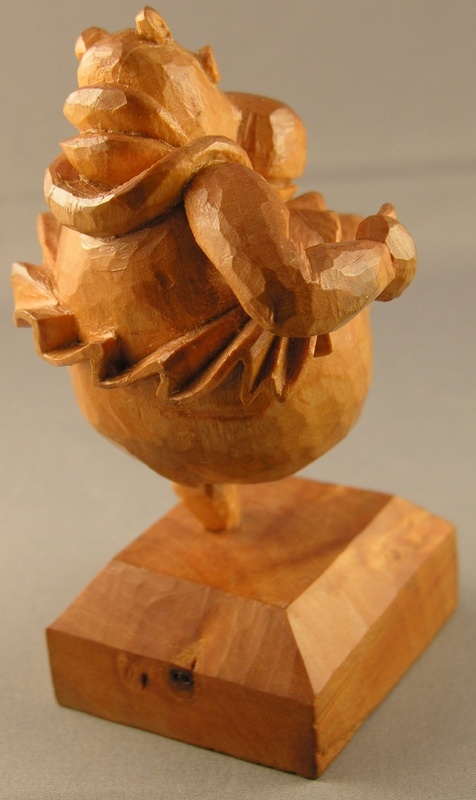 I used an article by Donald Mertz published in the magazine Woodcarving Illustrated Spring 2010 www.woodcarvingillustrated.com for the pattern and carving tips. 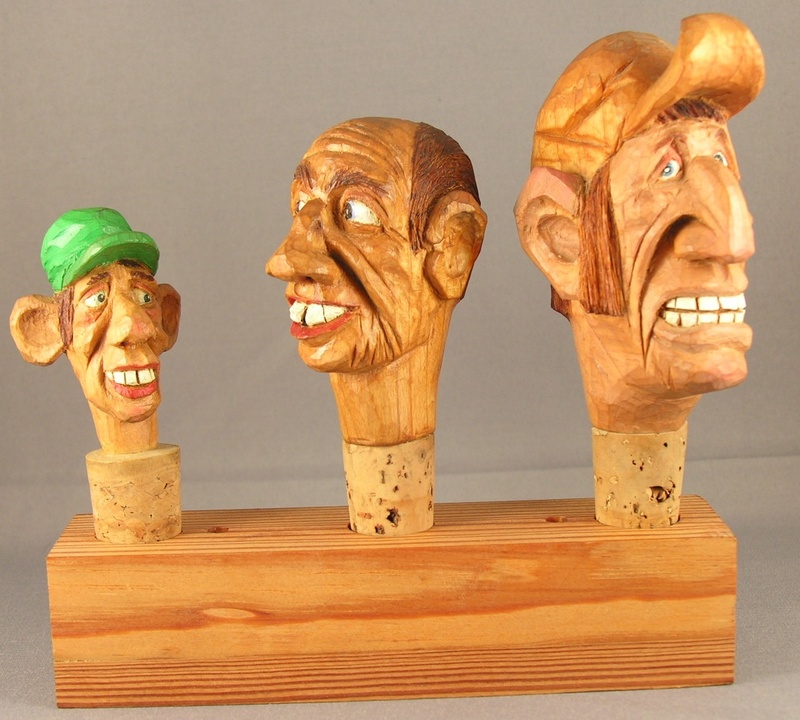 The author is a member of the Caricature Carvers of America. Renaissance wax is a micro-crystalline wax polish used extensively by the British Museum for preservation of art forms. It is hard enough to not show finger marks. Characteristic features are in the detail e.g. broken shoes, trouser patch, knee and elbow tears, broken shoulder seams. This was my first experience of creating shadow by deep undercuts. The knee and elbow tears are deeply under cut with a detail knife to create depth and shadow, quite tricky needing good light and a sharp blade! The start of my move into unpainted caricatures. 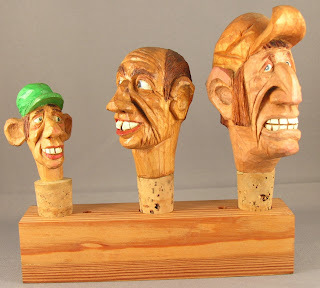 These guys were carved from an idea triggered by a character called Bufford in a carving magazine from the US and reminds me of a good friend who rides a bike in Australia. Finish: Beeswax dissolved in linseed oil. 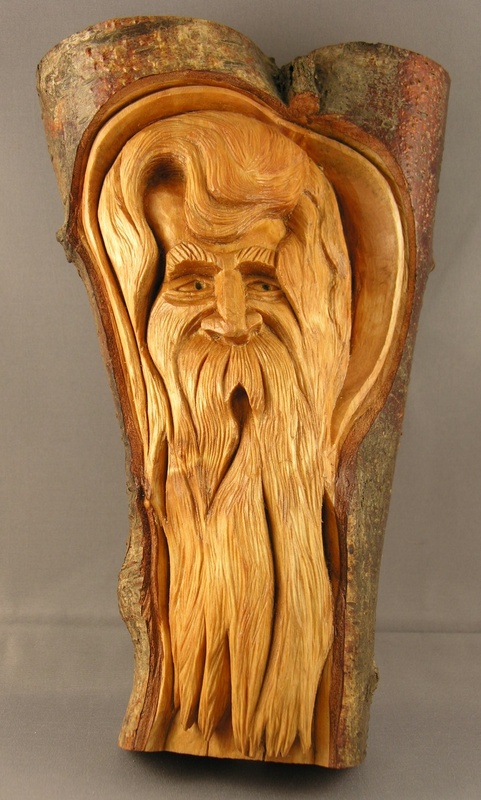 The wood was carved wet, then dried using the auto-defrost function of a microwave oven. A stress-relief hole is bored up from the base of the figure as high as possible. Then sealed in a plastic bag the figure was subjected to 4 x 4 minutes defrosting in the microwave oven, opening the bag after each 4 minutes to let the water vapour escape. These 3 figures I was less than pleased with. The central face bears a recognizable likeness to the owner but the 2 flanking heads are disasters! 2. Never use pure black or white paint, it distracts attention from the rest of the piece. These are my first attempts at caricaturing some well known faces in the UK. 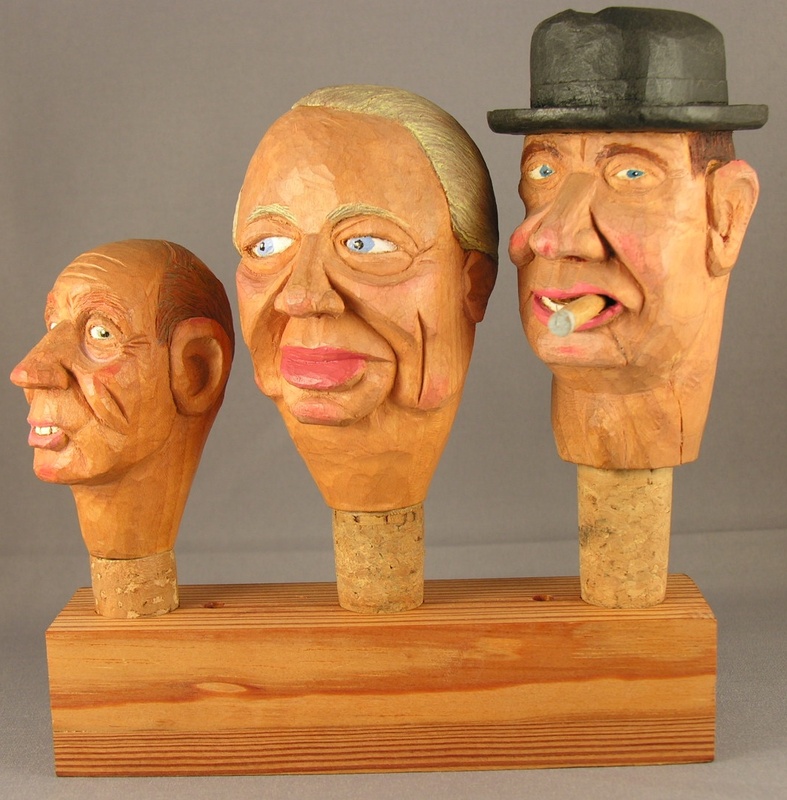 I was reasonably pleased with these 3 pieces each bearing some resemblance to the face I had in mind! 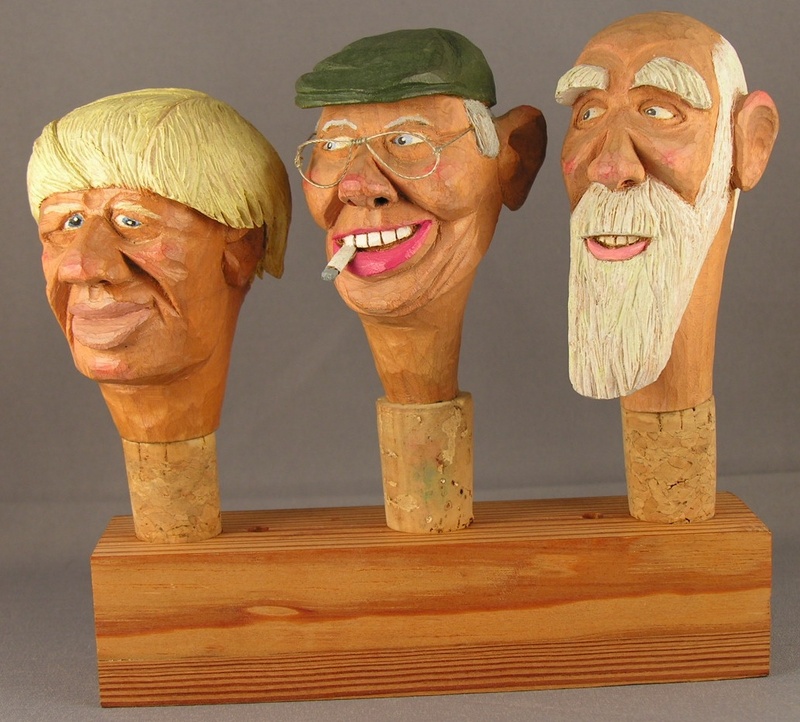 The figures are carved in Lime (Tilia x europaea), are between 6 -9 cms high and mounted on cork bottle stoppers. 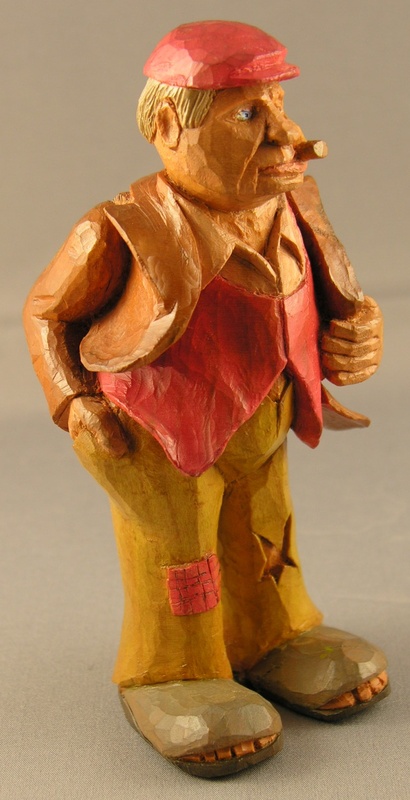 The wood is left with a tooled finish, coated with linseed oil, then painted with acrylic paint for the eyes and teeth, and diluted oil paint for the remainder. When dry the figures were polished with beeswax polish then buffed with a brush once dry.